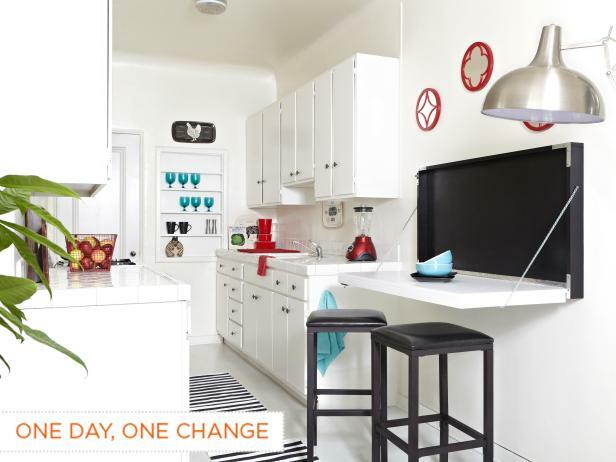 Small kitchen spaces can be a real challenge to organize. 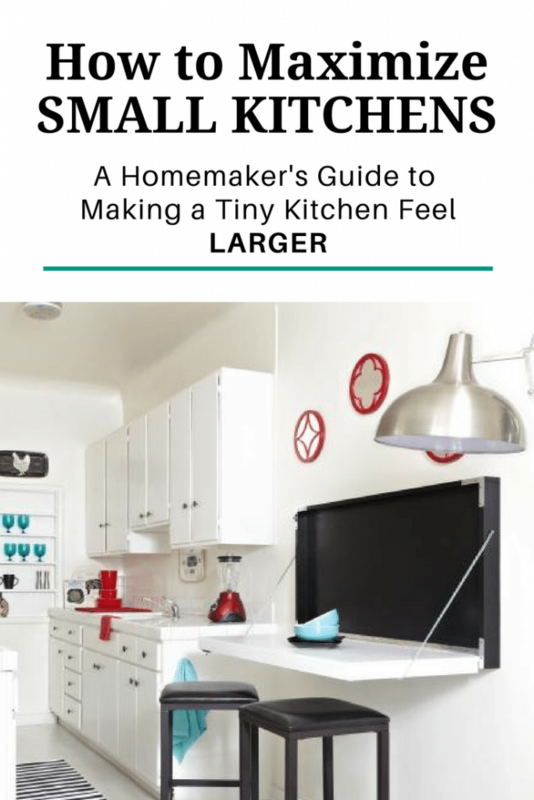 If you’re struggling to fit things in your tiny kitchen, this post is for you. 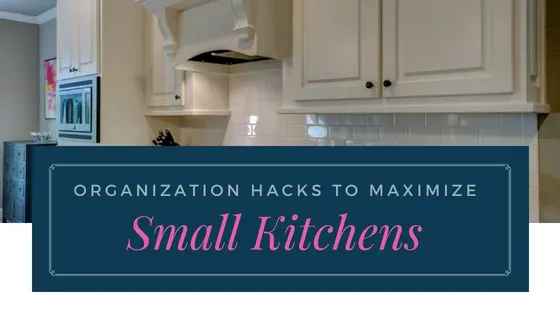 Whether you are renovating, or just starting to organize your kitchen, or you just want to rearrange things, there are solutions which can make your small kitchen feel larger. So there’s no need to feel discouraged because of your tiny space. 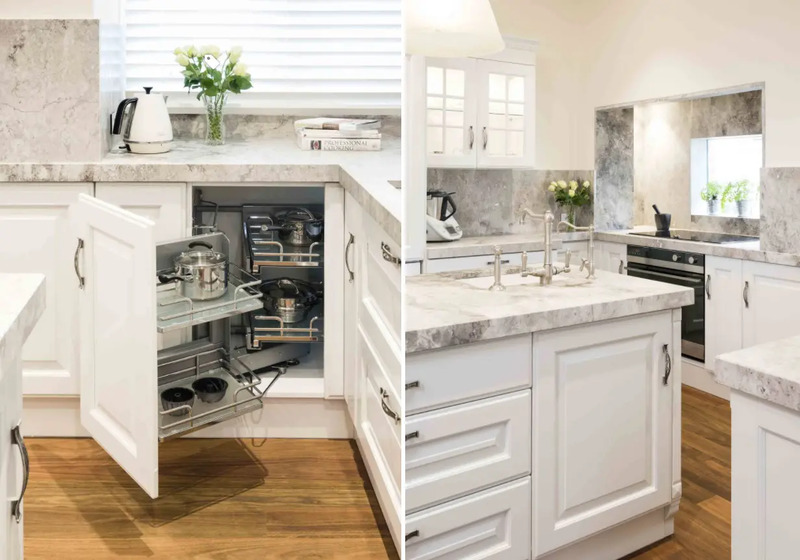 Gather inspiration from these clever ideas from various sources to help you make good use of every inch of your kitchen. 1. 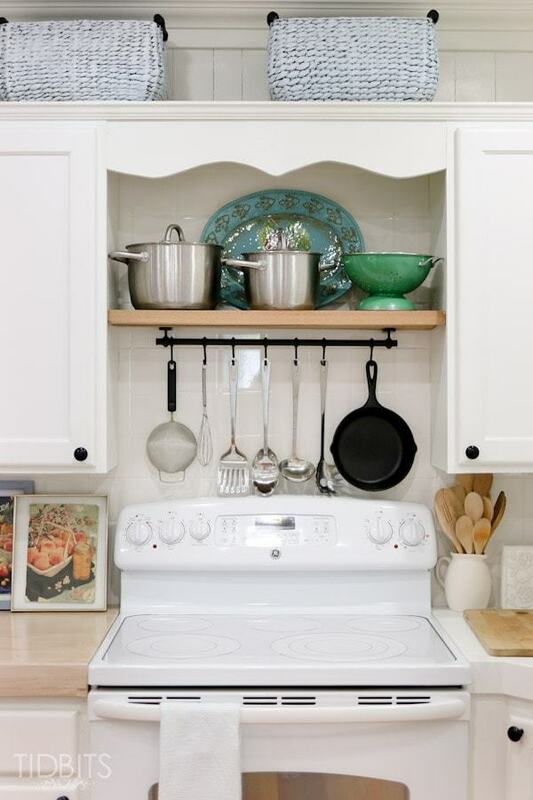 Store your pots, pans and cooking utensils above the stovetop. 2. 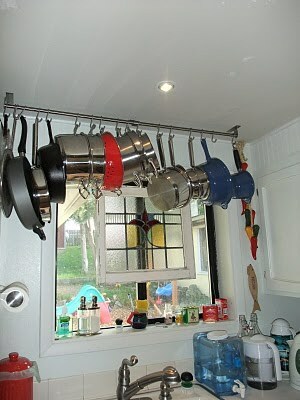 Or use a single bar ceiling-mount pot rack. Then hang your pots and pans there. 3. 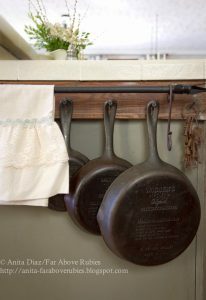 Use an antique ladder if you like a rustic look. 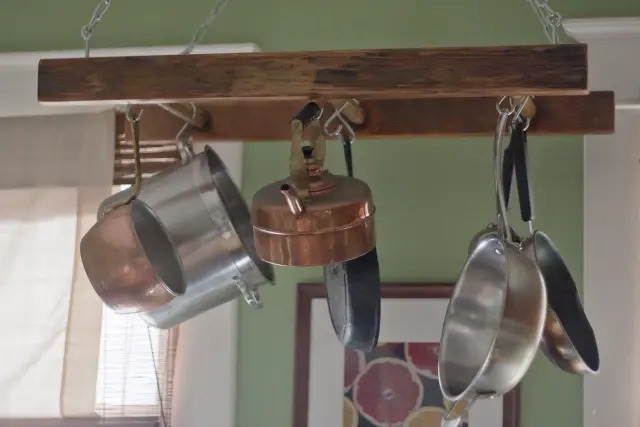 Another creative way to hang your pots and pans! 4. 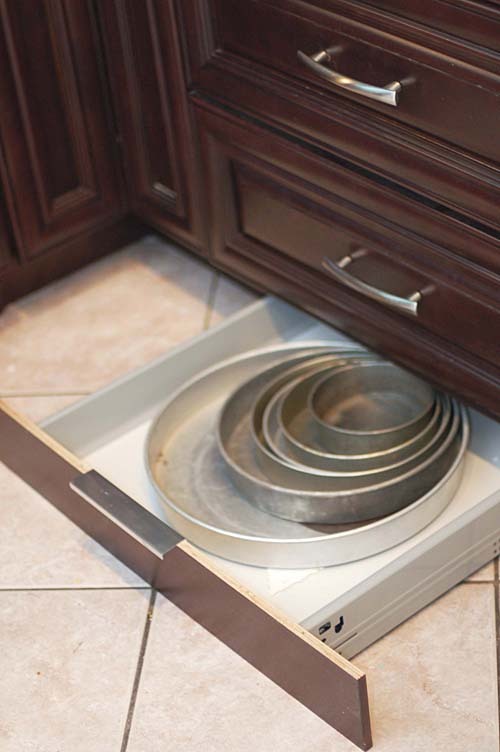 Use a bakeware organizer to stack pans. If you can’t hang them, then why not stack them? 5. 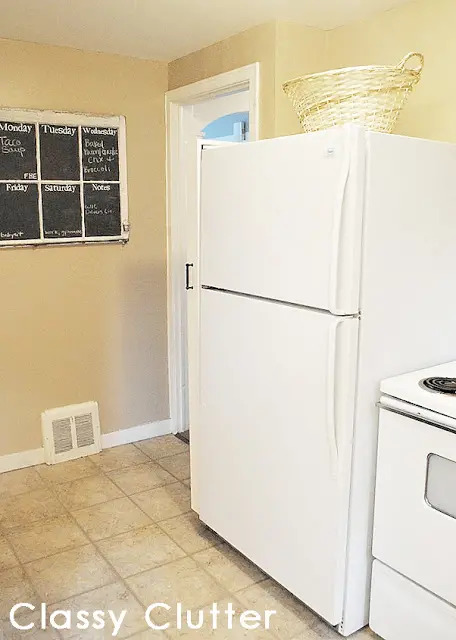 Use the space between the wall and the fridge. 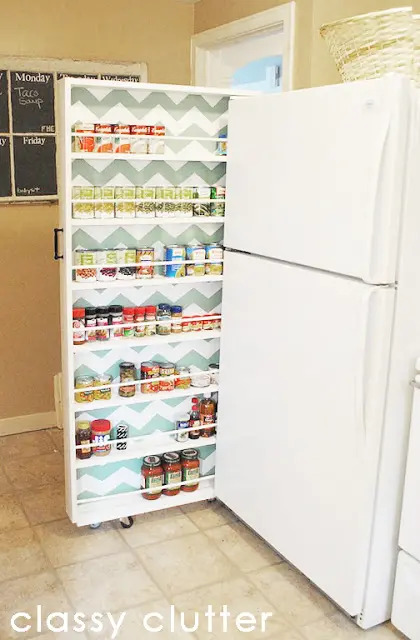 Make a rolling pantry. Then simply pull out when you need to get something. 6. 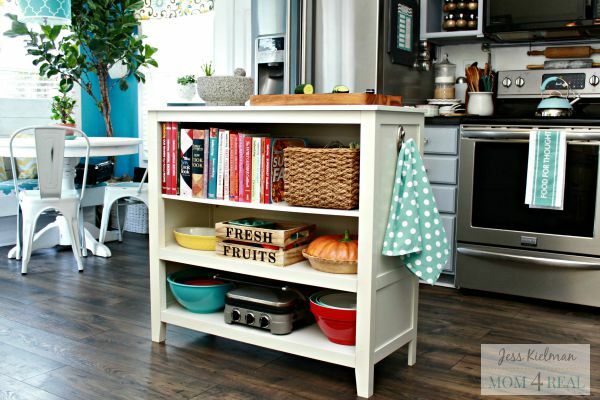 Invest in a kitchen island. You can even use a sideboard for this. Just remove the doors if you have no more space for opening them. 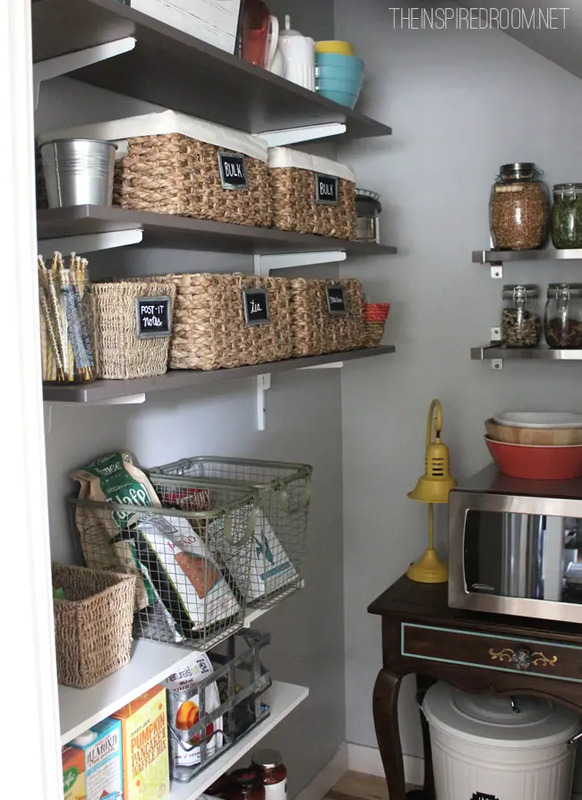 7.Transform your little nook into a storage space. 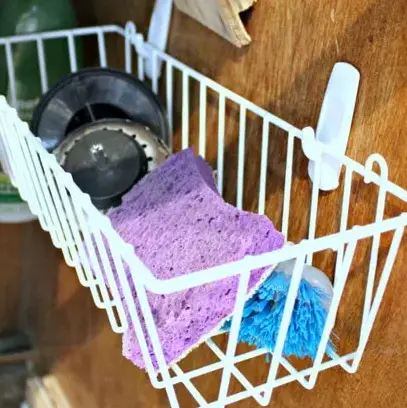 Hang desk organizers and use them to get wet sponges and scrubbers off your sink. 8. Use a double purpose wooden shelf. Isn’t this lovely? 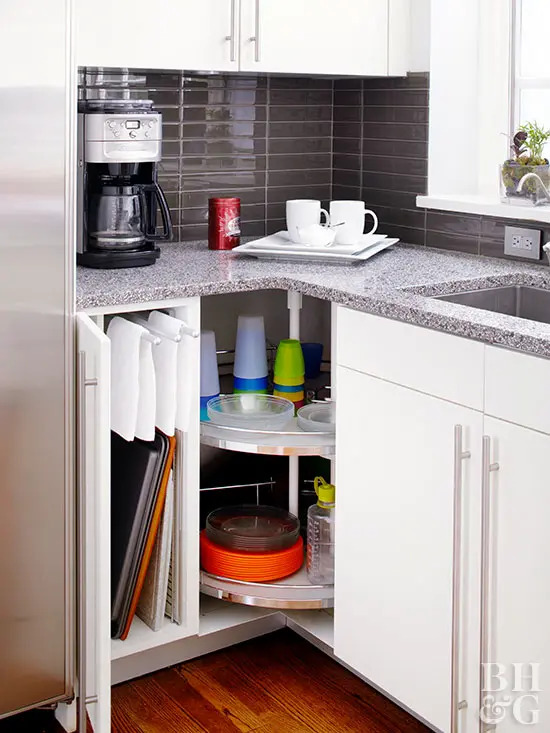 You can use both the up and underneath space for storage. I’m really impressed with the underneath space. It’s so perfect for glass jars. Really never thought of this before. You simply screw on the lids under the shelf. Then when you need it, just twist the jar. 9. 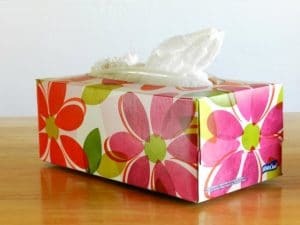 Upcycle empty tissue boxes. If you have plastic bags that you want to be contained, you can use empty tissue boxes for that. Think about this before your throw that tissue boxes away. 10. 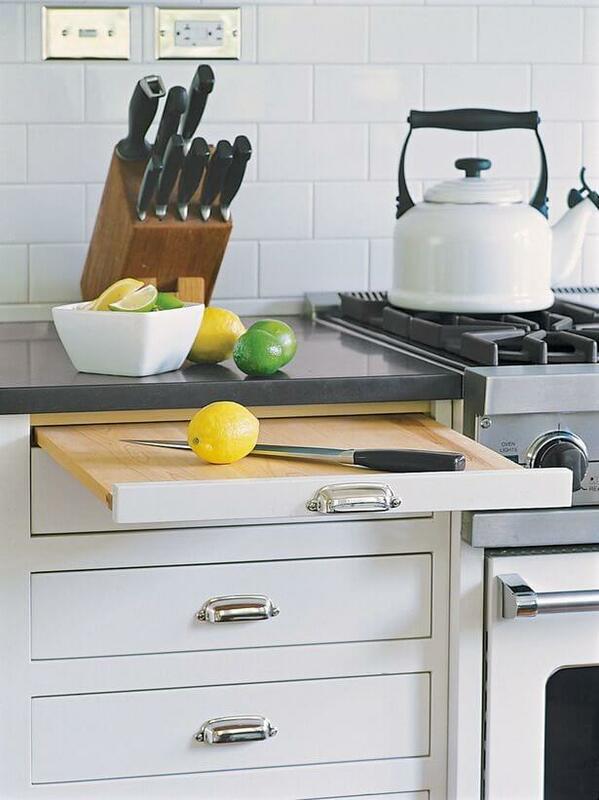 Use the side of your lower cabinets. 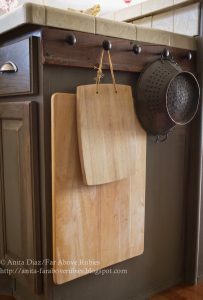 You can use it to hang your pots, pans and chopping boards. 11. If you have an upper cabinet, use its sides too. 12. Use tin cans for utensils. 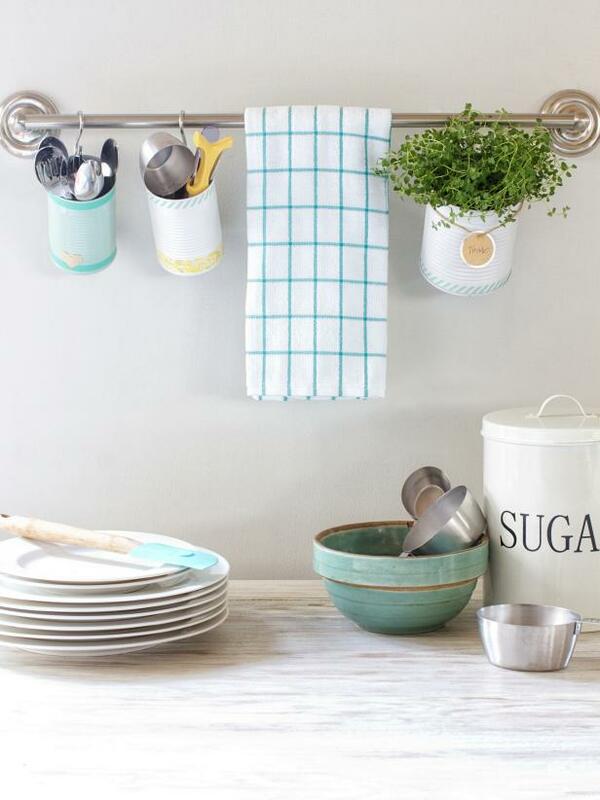 Upcycle your tin cans and turn them into utensil bins. 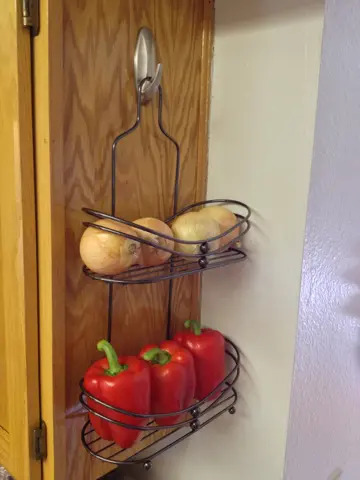 Use an S-hook and a towel bar to hang them. Then put in your silverware. A really clever and creative idea to free up some drawer space! 13. 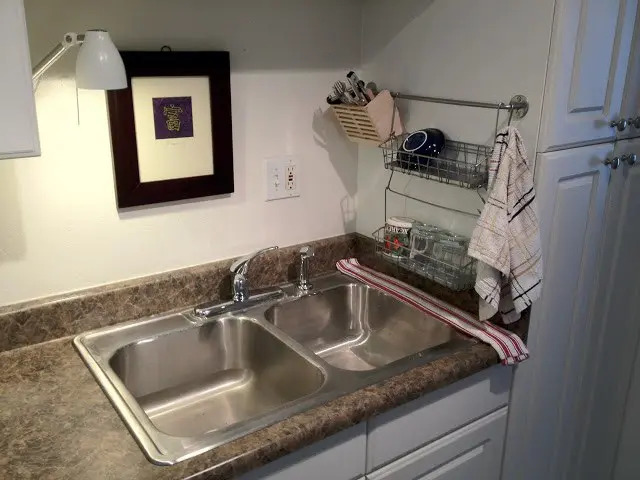 Mount a dish drying rack to the wall. 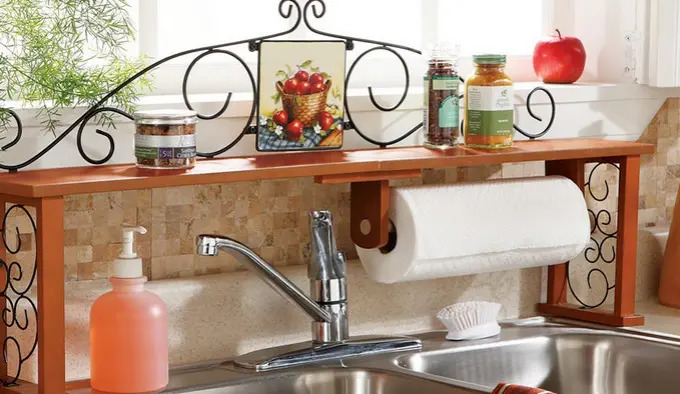 Instead of having it on your countertop, you can make use of the wall. Just place a towel or rag underneath to catch any drip. 14. 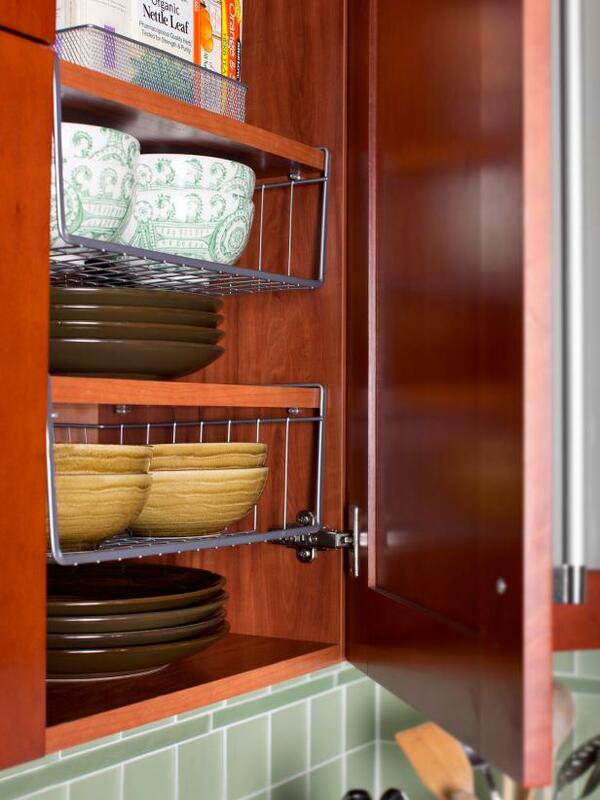 Utilize the back of your cabinet doors. 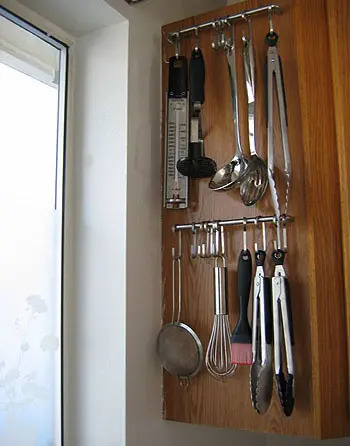 Hang the cooking utensils that you regularly use. 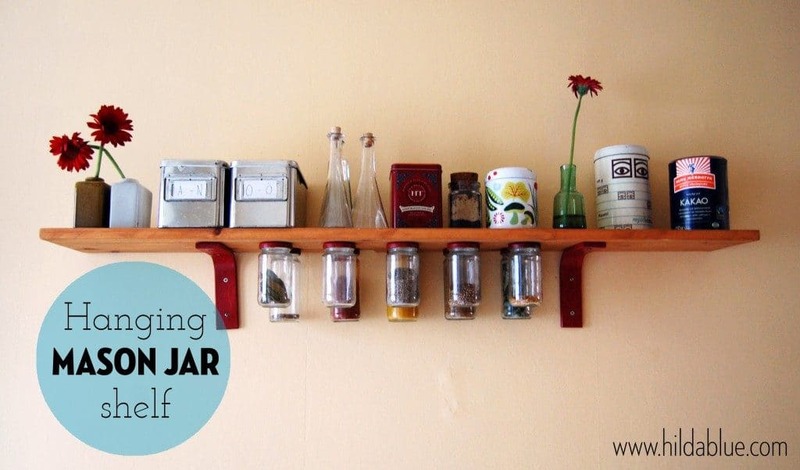 If you’re fond of baking, you can hang your measuring cups and spoons here. It’s a very good option especially when your kitchen cabinets are already full. 15. 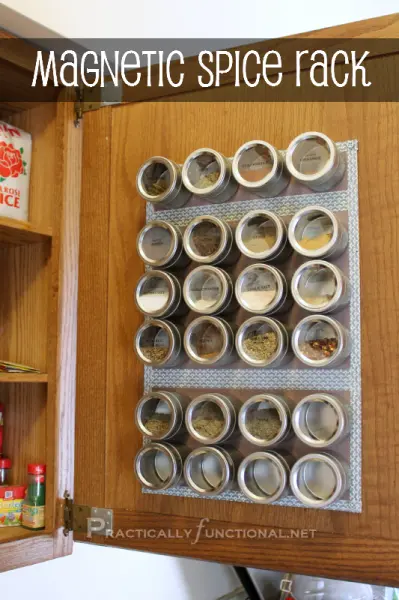 Invest in a magnetic spice rack. Get those spices in order! You can stick them inside your cabinet door or on the side of the fridge. 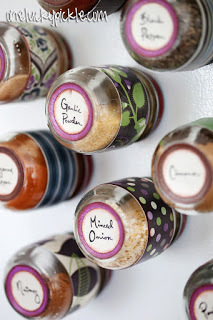 If buying spice jars doesn’t fit in your budget, you can try making your own set by using babyfood jars. 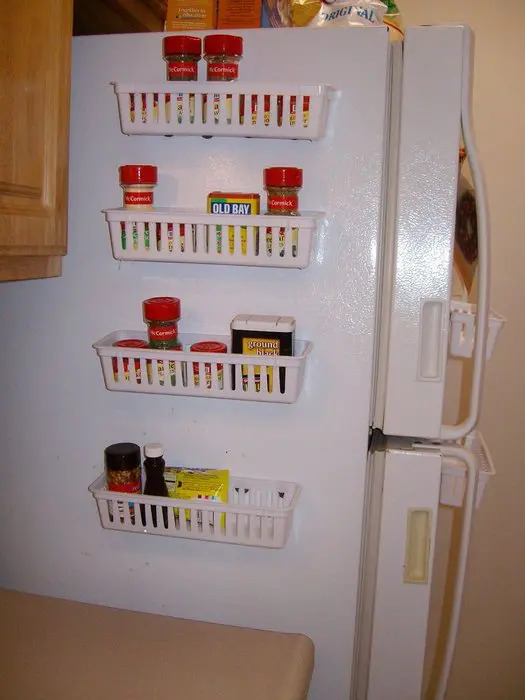 This one uses pencil holder organizers and sticks them to the fridge. 16. Magnet wrap boxes on to the fridge. 17. 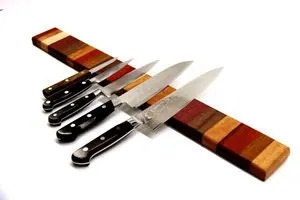 Use a magnetic knife strip. Depending on your choice, you can use a metal type or a wooden one like this. 18. Install a flip-down shelf. 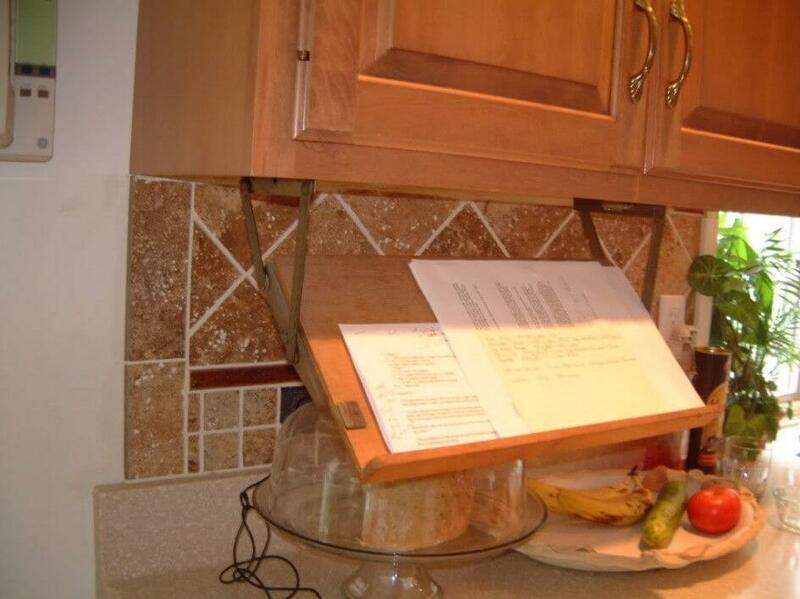 This is cool when you need a little extra space to put your cookbook during meal prep time. When you’re done cooking, simply flip it back to its original position – locked to the wall. 19. 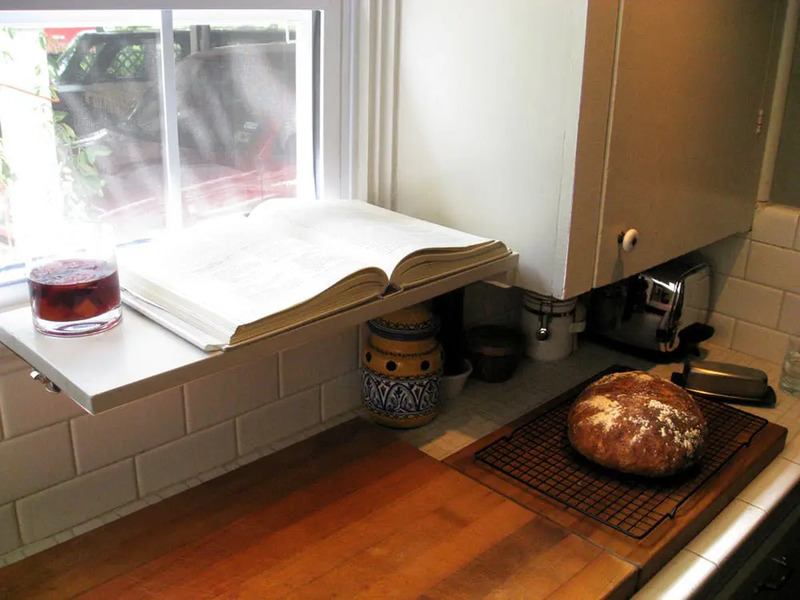 Build a retractable book stand under the cabinets. This is another style but the concept is much the same with the flip down shelf. 20. 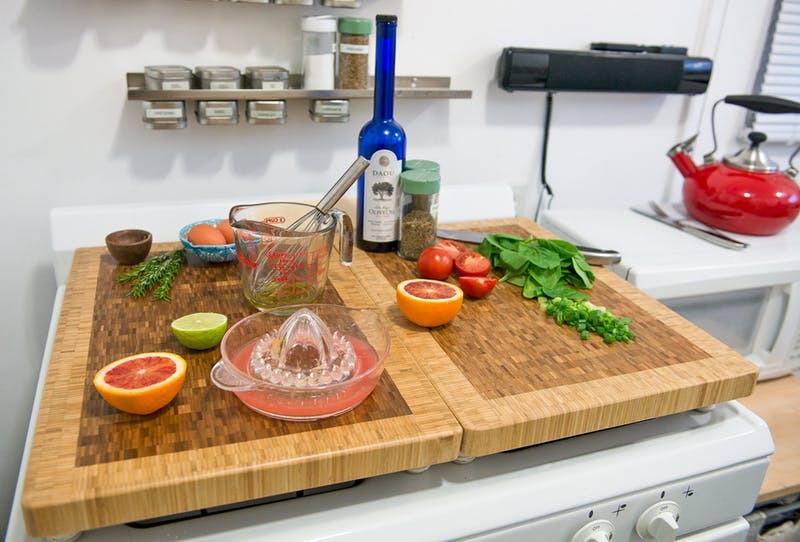 Buy a chopping board that can be used over the sink. 21. Have a pull-out chopping board. It’s just like one of your drawers. 22. 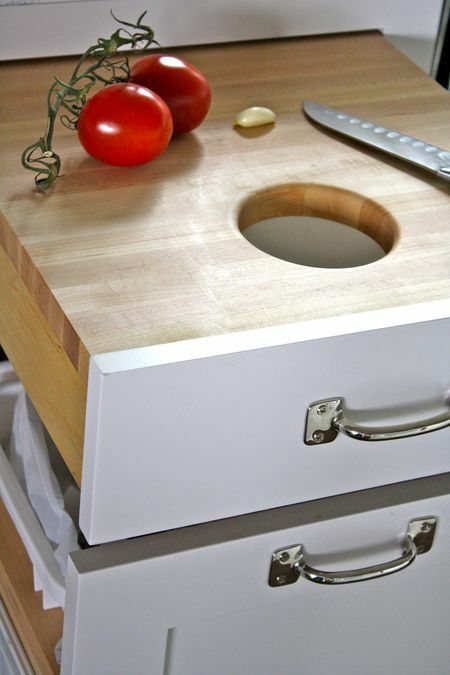 A chopping board that sits over the garbage is also a great option. When you’re done chopping, simply slide the scraps into the hole, down the trash bin. 23. Build a burner cover. If your counter space is good for only one person, you can use the stovetop as your extra counter. That’s where the burner cover comes in. 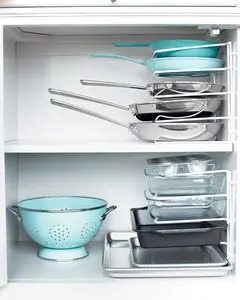 Hold your pot lids in a vertical position using tension rods and keep them from cramming the drawer. 25. 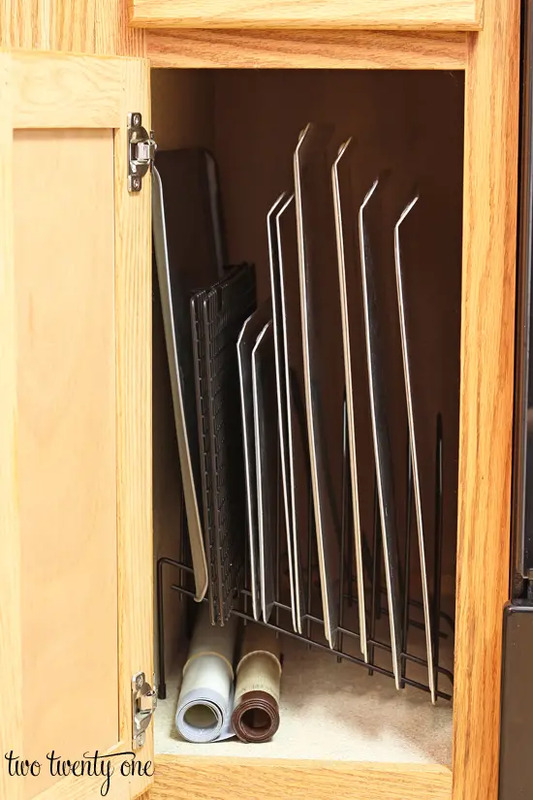 Use a dividing file rack for baking sheets and racks. 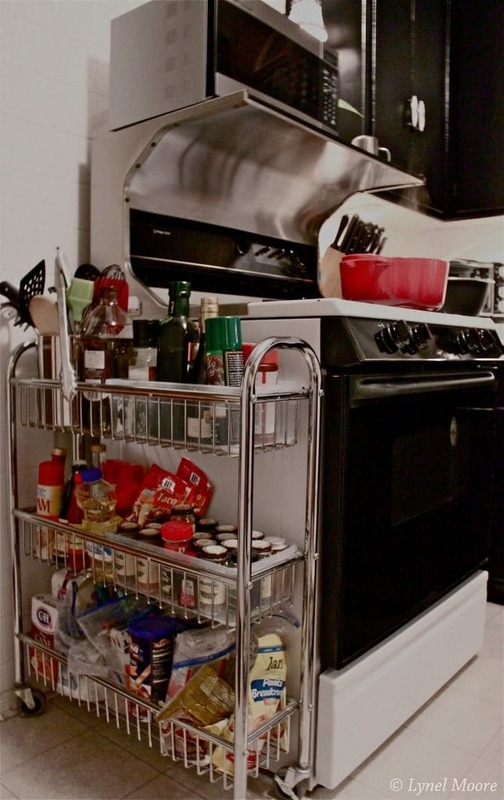 Easily locate the baking sheet you’re looking for. No more wrestling with the other sheets. 26. 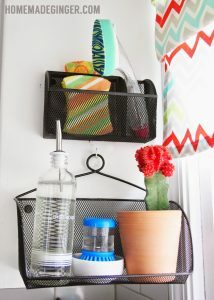 Use a hanging shower caddy. 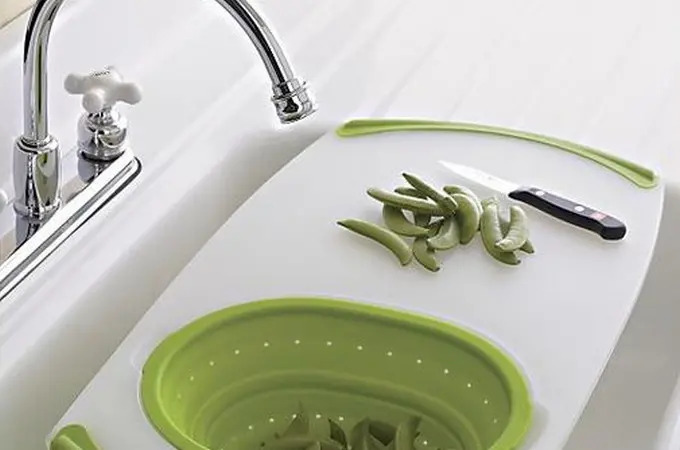 Let it hold your produce and free up some counter space. 27. Use a wall-mounted food dispenser. 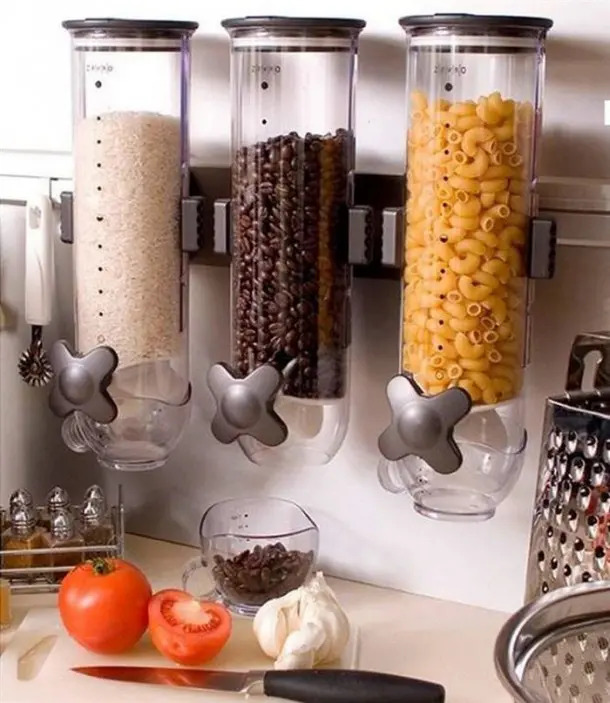 Instead of using containers for beans, cereals and grains, you can use food dispensers mounted on kitchen walls. This frees up space that would otherwise be taken by your containers. 28. 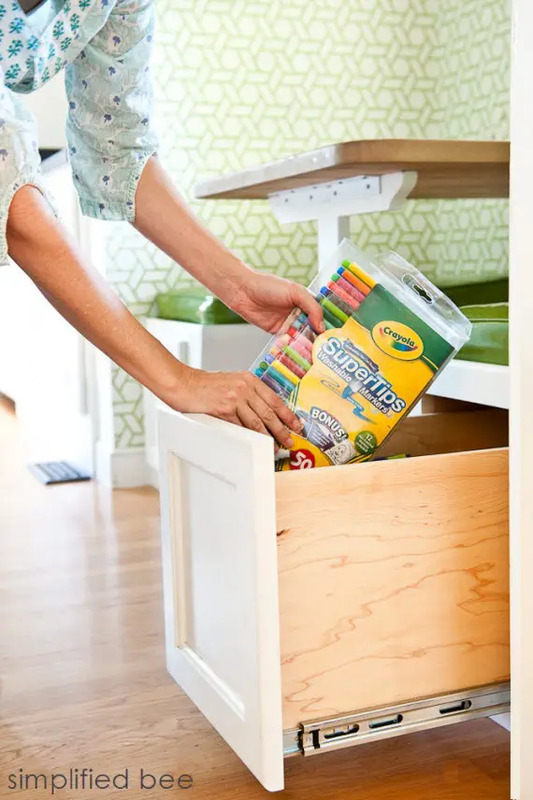 How about an under-cabinet bin? 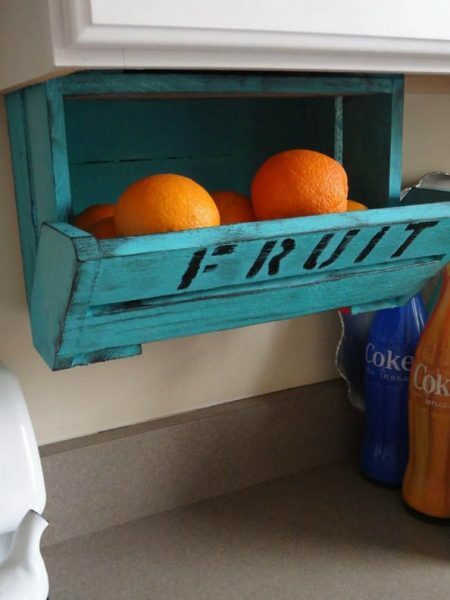 Keep your fruits safe and easy to reach without taking up too much counter space. 29. 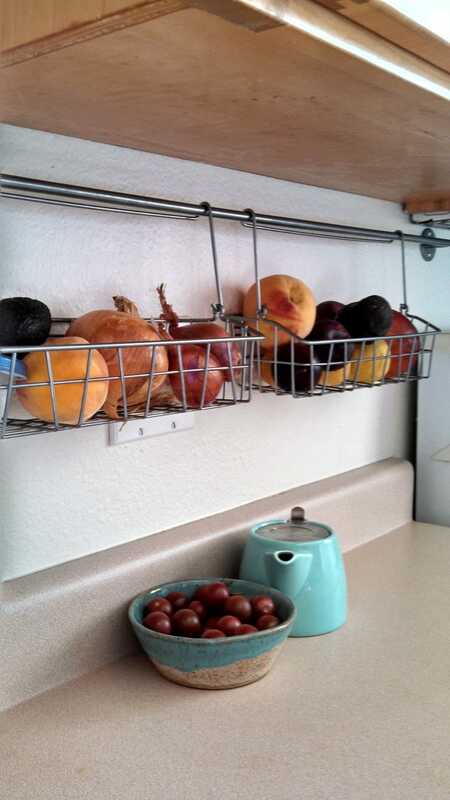 Use baskets to lift those produce off the counter. 30. Use the corners for storage. Or place a Lazy Susan inside. Then remove the corner door for an easy access. 31. 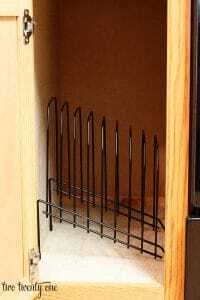 Use wire racks to create more compartments inside cabinets. Mount them under the shelf. 32. Use a serving tray as shelf divider. 33. 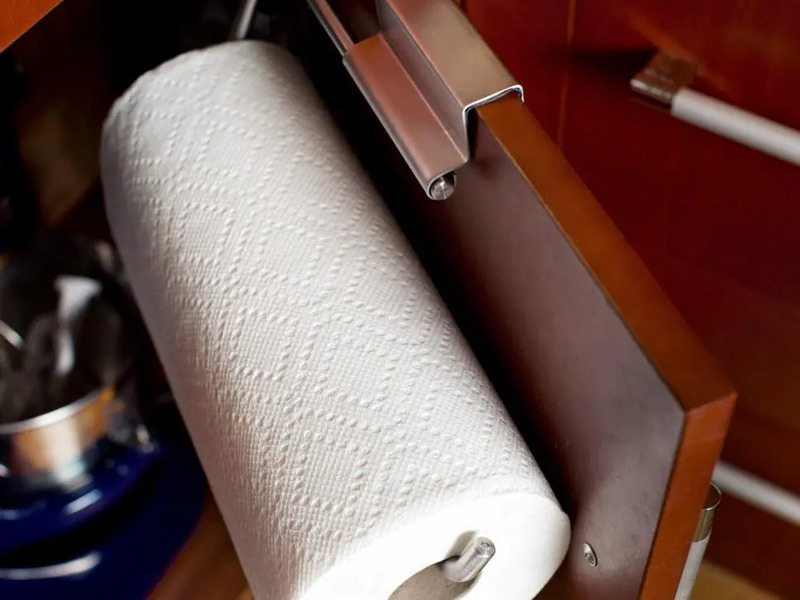 Mount a paper towel holder inside the cabinet. 34. 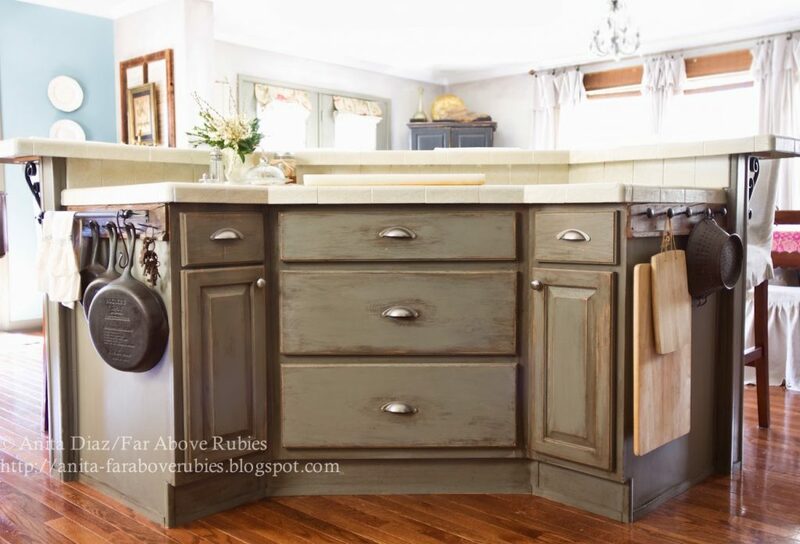 Add a wooden shelf on top of existing cabinets. 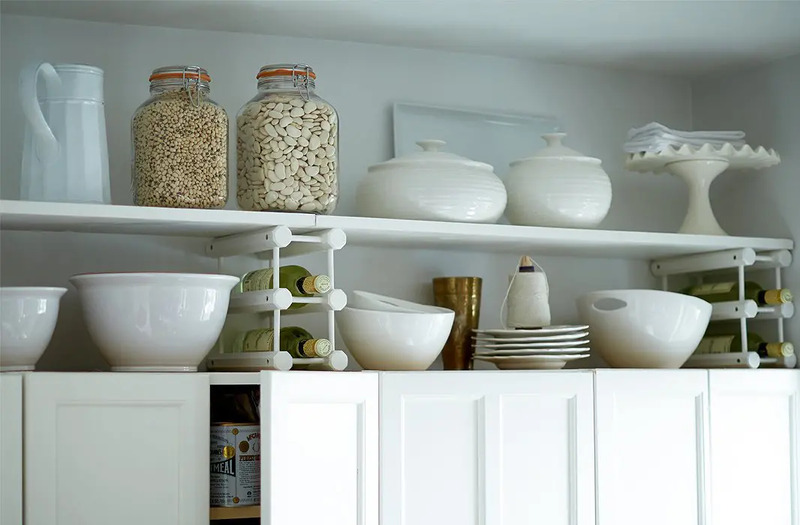 If you have a wide space above your kitchen cabinets, making shelves and using wine racks can give you an excellent additional storage space. 35. Make a toekick drawer. 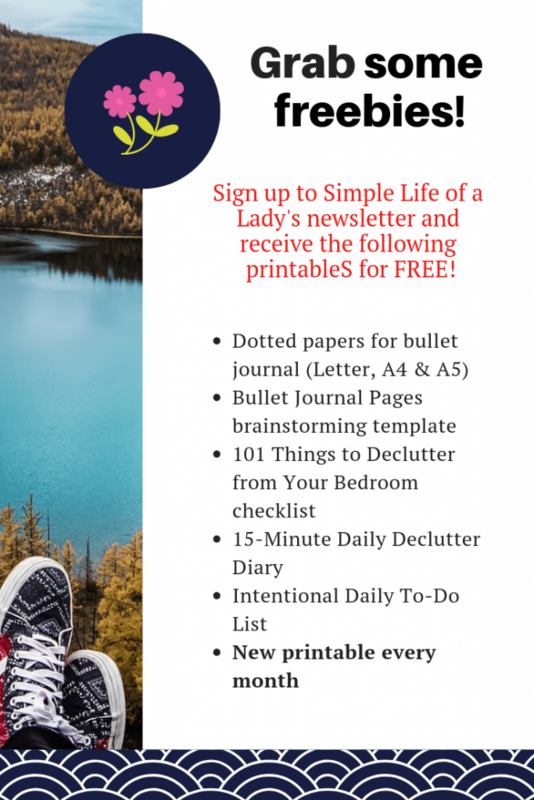 Look at your drawers and cabinets. Usually, it has a dead space underneath which often accumulates dust. 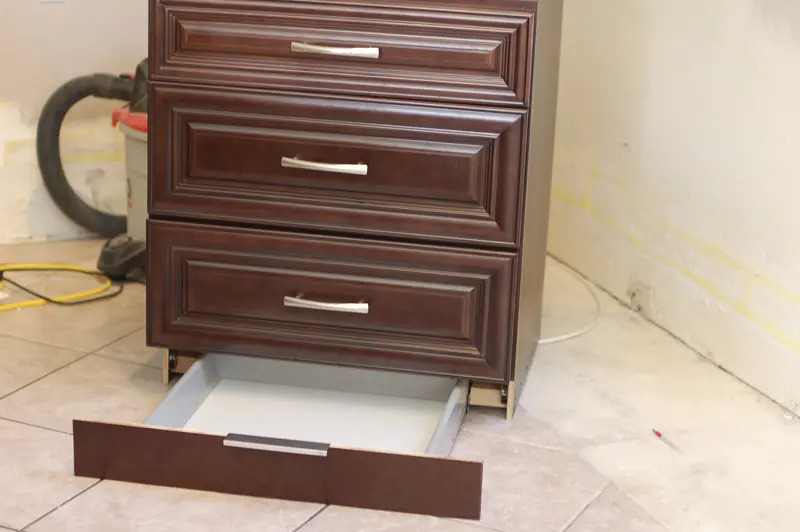 You can turn that small space into an additional mini storage by building a toekick drawer. 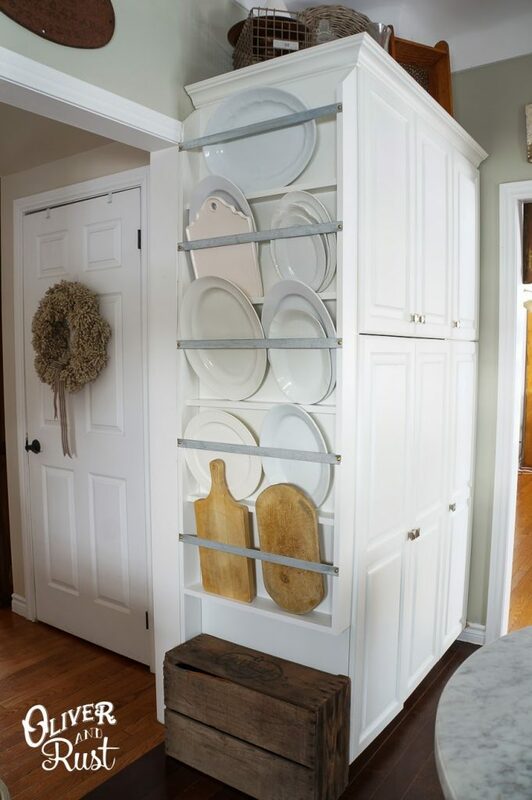 You can do this on your existing cabinet. If you are planning to assemble new ones, it is even easier to apply this hack. 36. 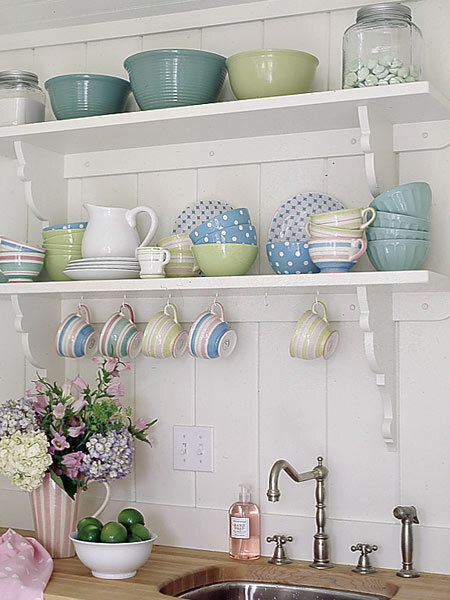 Use a wall-mounted shelving. This is a clever way to take advantage of the walls. 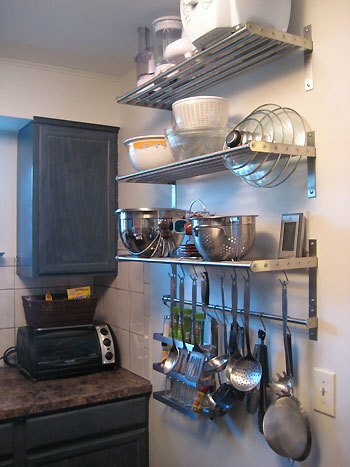 Mount kitchen shelves on the wall and use this space to store your cooking utensils. 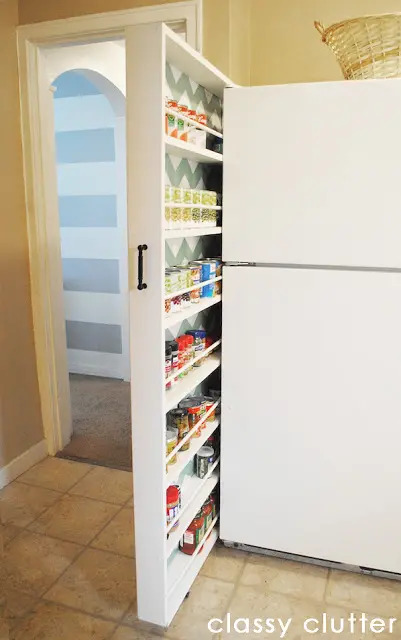 If you have no pantry, you can also place your cooking supplies here. 37. 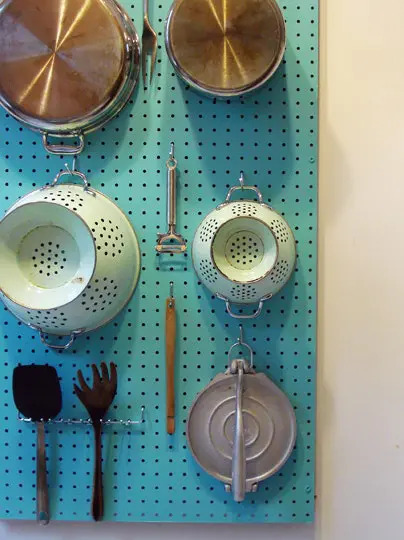 Install a pegboard on the wall. 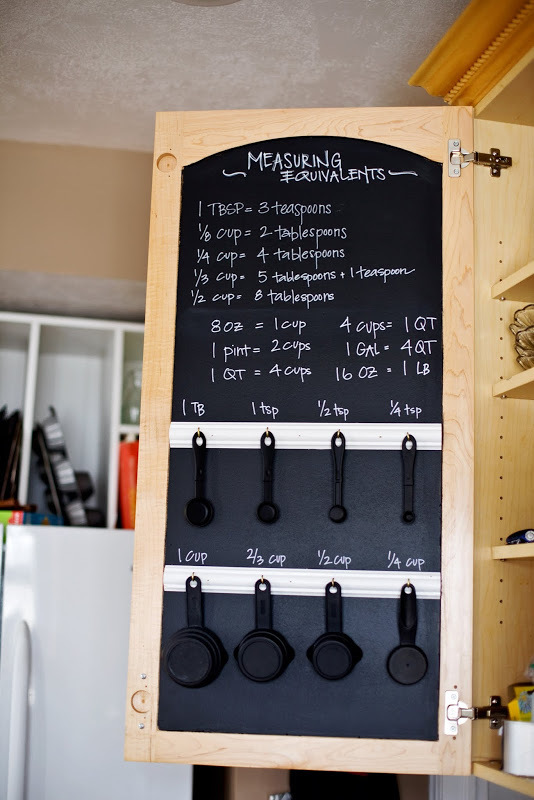 Use it to organize your pots, pans and utensils. 38. 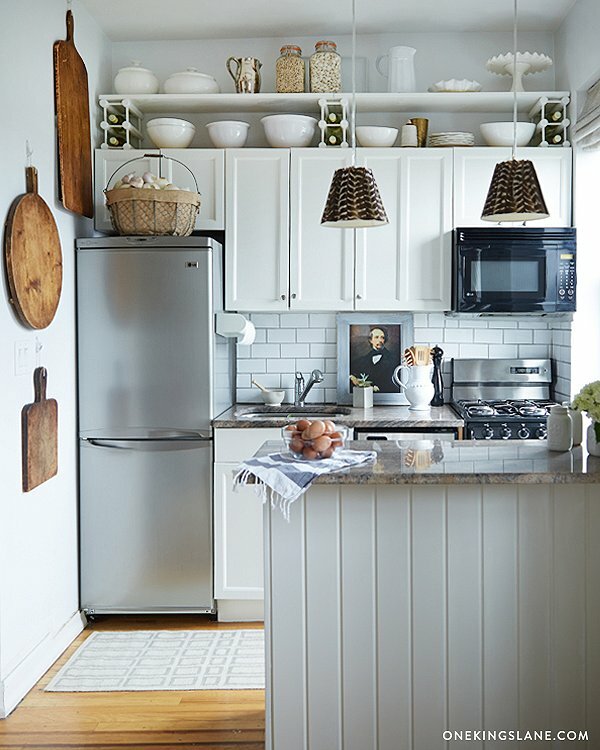 Try an open shelving. You can try this idea to enjoy the natural look of piled dishes, especially if you have attractive ones and you like the look of them. You can also try this on your pantry. 39. 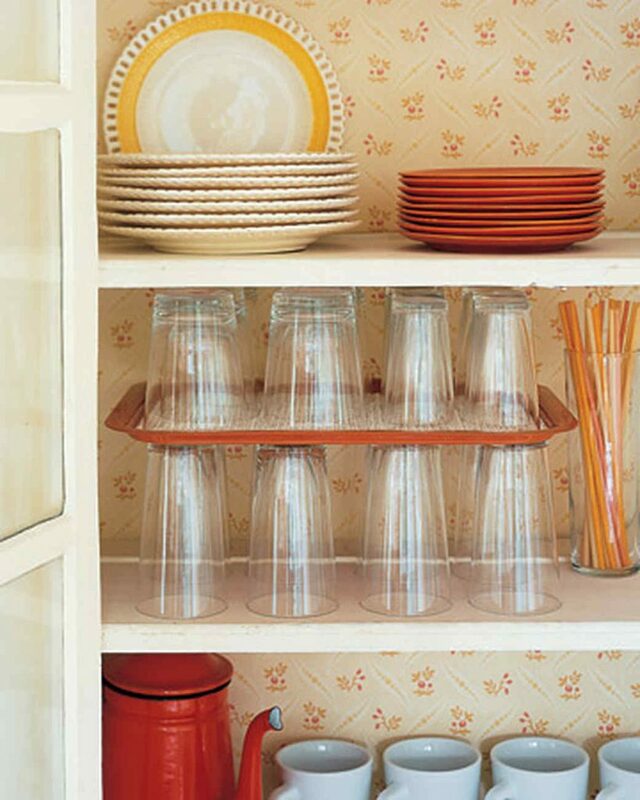 Make a plate rack. If you have oversized plates, you can try this one to arrange them, and without the worry that you might smash them together. 40. Invest in a narrow rolling cart. This can easily fit it into an available tiny space. Plus the rollers make it possible for you to take it anywhere you want it to be. This is always awesome for additional storage. 42. 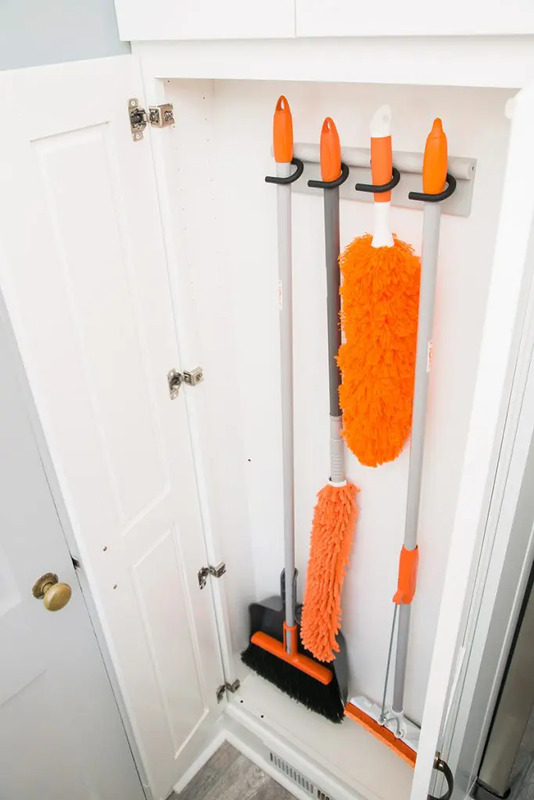 Tuck away cleaning tools in a tall and narrow cabinet. 43. 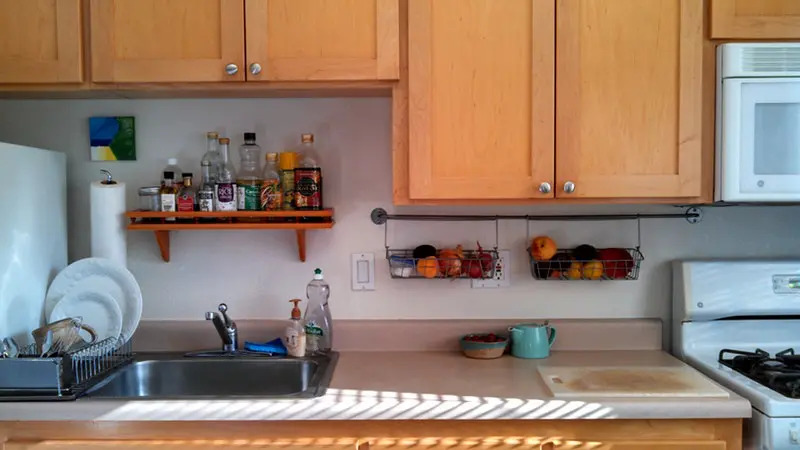 Buy a sink shelf. 44. 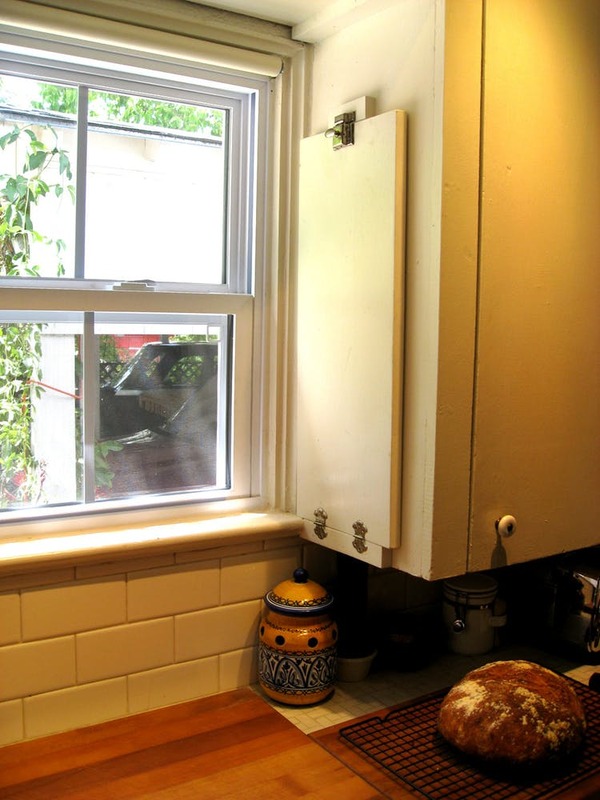 Install a kitchen sink tip-out. 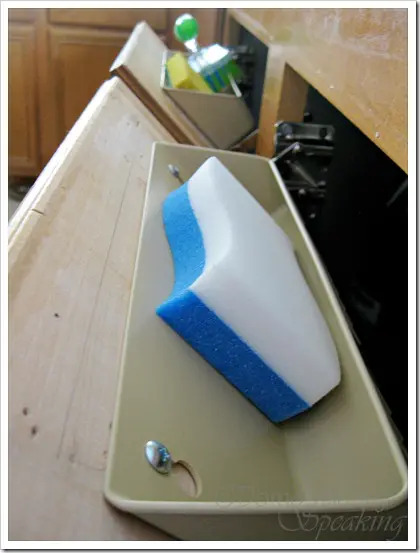 This is another great place to store your sponges and brushes. 45. 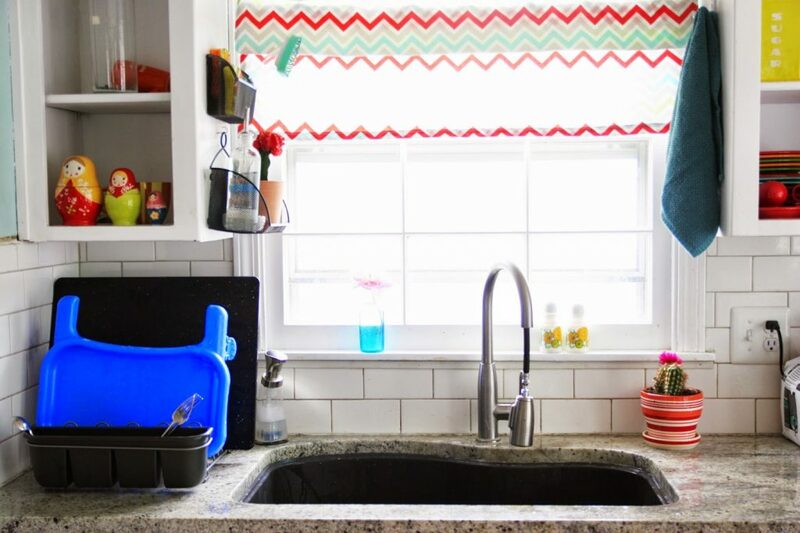 Install a trash bag organizer under the sink. 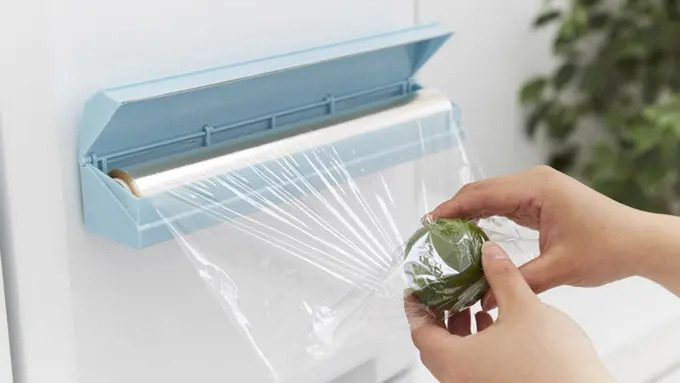 If you’re struggling to keep your trash bag rolls together, especially if those come in large sizes, this is a great solution you can try. Keep it within reach in a tiny space and still be able to provide space under the rolls. 46. Use a tension rod, again. 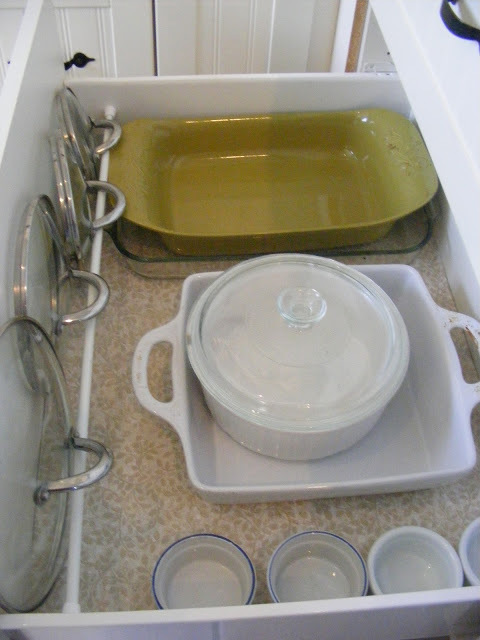 A while ago, I showed you that tension rods can be used to hold pot lids in vertical position. 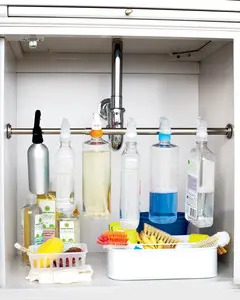 You can also use them under the sink to suspend your spray bottles. 47. How about a pocket organizer? 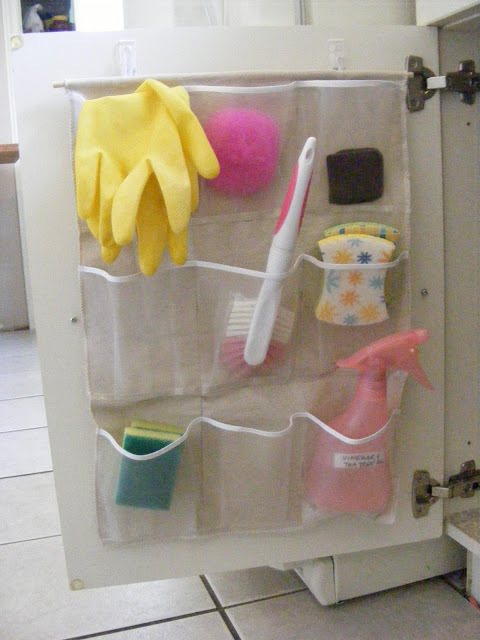 Maximize that space under your sink by hanging a pocket organizer. This is another good option to store your sponges, brushes and gloves. 48. 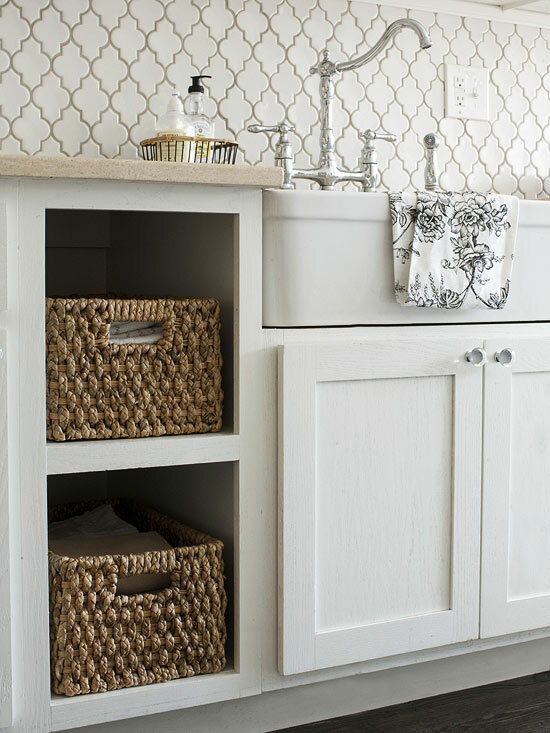 Get some command hooks and small baskets. 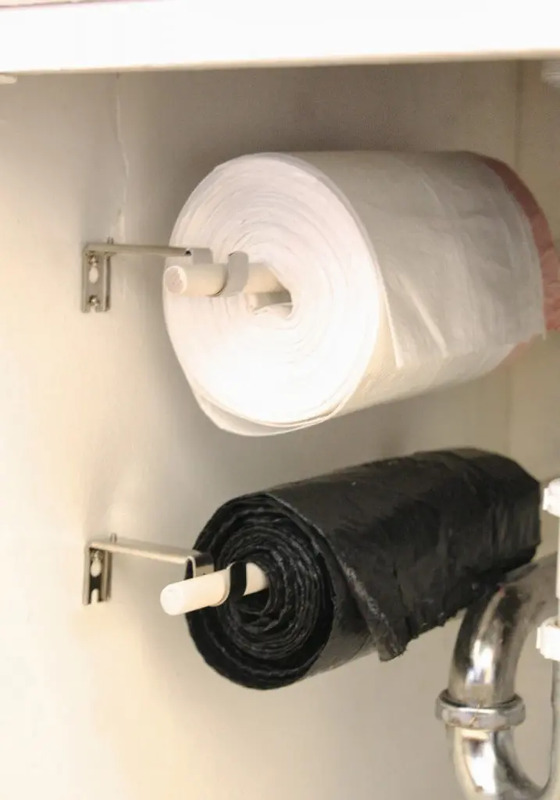 Install them under the sink for extra storage. 49. 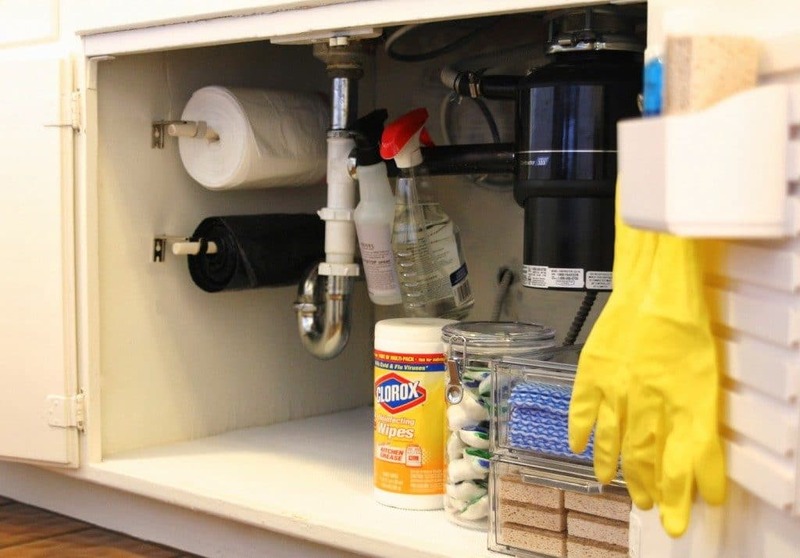 Consider building an under-sink roll-out tray. 50. 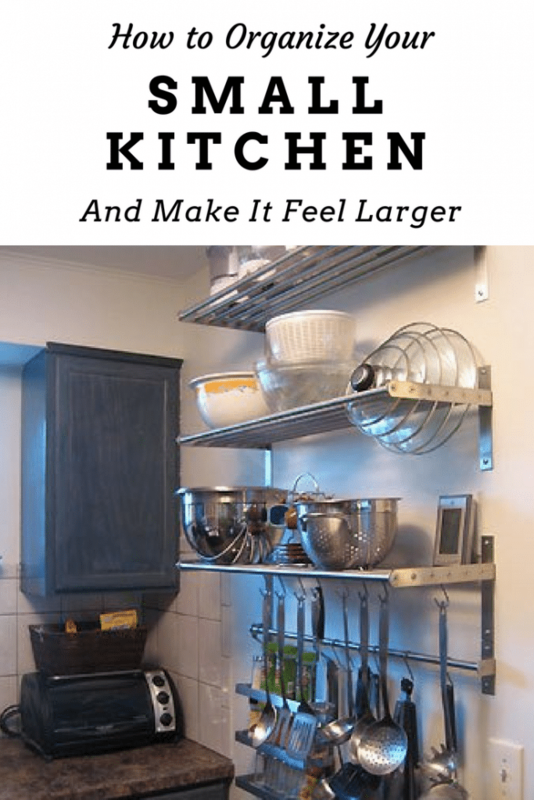 Maximize your kitchen nook. 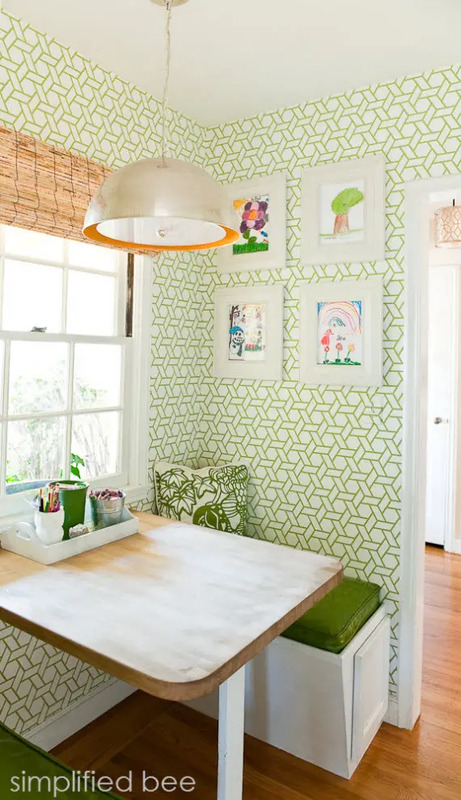 Add a small table and bench where the kids can study and eat. It doesn’t take up much space compared to dining chairs. Plus you can have a pull-out drawer installed under the seats for extra storage. 51. Build a flip-down kitchen table. Don’t let space stop you from enjoying your time in the kitchen. 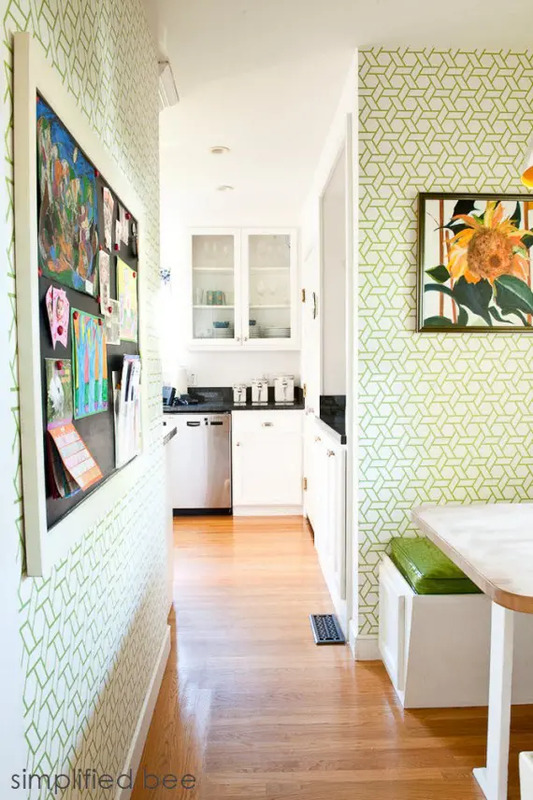 Use these ideas to maximize every space in your little kitchen. Remember that no matter how small it is, you can always take advantage of the space that you already have. If you think this article is helpful, kindly take a second to PIN it. Sharing is caring!